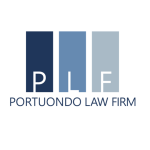 Marisa Portuondo Was Recently Interviewed By IdeaMensch - Portuondo Law Firm, P.A. Marisa Portuondo was raised in the Key Biscayne community of South Florida. 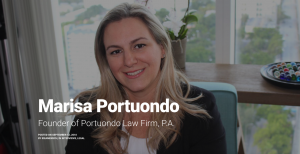 Prior to attending law school, Ms. Portuondo graduated with a Master of Science degree from Florida International University’s College of Business and worked in the pharmaceutical industry managing over $60 Million of pharmaceutical raw material in several worldwide locations. To learn more about Marisa, click here. I had been an attorney for a few years and I had a business background. The economy had tanked. I was working for other people who were having a hard time keeping their law firms open. I decided I could do it better. A typical day starts off with our toddler and I having breakfast and getting ready for our day. I drop him off at school and head to work. Upon arriving, I have a daily meeting with my assistant. This is crucial and sets the tone for the day as well as helps to make sure nothing slips through the cracks. I typically prepare a to do list the night before and once I tackle those crucial items, I work on other tasks I have assigned to myself. I stay productive by limiting interruptions. When I am working on a case, it gets 100% of my attention. I don’t leave my email open, I let my assistant handle all non-urgent calls, and I stay off social media. I take breaks between major tasks and try to walk around the office and yes, sometimes I check social media. Your brain really needs that downtime throughout the day and your body needs to move! I read a lot. I engage in Facebook groups made up of other attorneys and law firm owners. I ask a lot of questions. Then I process everything I’ve learned and make it work for me and the Firm. I am never not coming up with ideas, it never shuts off. I love that attorneys are finally getting into marketing and many are doing so in fun, creative ways. In a profession where letting your personality shine is not exactly the norm, it is great to see that happening more and more. Having a management information systems background before law school, I am also a total tech geek – so I am very excited that the legal community is finally starting to catch up in that regard. I am always learning more ways to automate my Firm. 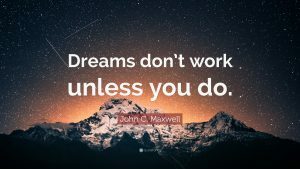 It is a never-ending pursuit and sometimes automation can be very tedious, but it is a great investment of your time and energy. When you start to see the return on that investment, it almost becomes addictive. You start thinking of different ways to automate the systems in your Firm and the possibilities are endless. It took me a while to realize that my law firm was not just a job, it was a business. It was when I finally made that mental pivot that things really started to change for me. I would also get help sooner. I was a bit narrow-minded about what getting an assistant had to mean and had convinced myself I couldn’t afford it. But the world has changed, if you are creative you can always find people willing to work for you. You are only one person and you can only do so much. At a certain point you will reach a point where you will not be able to grow anymore without hiring help. Being able to recognize when you get there and finding a solution that works for your business and your budget is crucial. And finally, I’d tell myself to have a little more faith. Starting my firm with nothing was very nerve-wracking. But things kept working out because I was putting the time in. At some point, you will have to start putting money back into your business. This can be scary, but it’s a must. Think small, stay small. Trust your instinct and then take that leap of faith! You have to let people do their jobs. If your staff is performing well, meeting deadlines, and their work product is of good quality, leave them alone. Do not micromanage them. A lot of business owners, especially attorneys, are Type A and want to control everything. But I learned in my project management days long before law school that this is a mistake. Good help is hard to find – if you have good help, keep them happy. Don’t overmanage your staff. Listen to their ideas, often they will be better than yours. A happy employee is a better employee. Automate, automate, automate. There is so much administrative work that goes into running a successful law firm and we can’t bill clients for it. So the best way to keep afloat is to automate as many of those processes as possible. This goes for any business. I really care about my clients. I am honest with them, even when it means telling them that they should not be paying me to do certain things. Sometimes clients get very passionate, especially when they feel they have been wronged, and want to burn things to the ground with costly litigation. There are often less costly ways to resolve issues and some arguments are not worth legal intervention. They appreciate my candor. I strive to keep my clients happy. I want them to come back, I want them to refer me to others. Too many attorneys make it about themselves, it is not about us, it is about the service we provide. I was giving away my “product” for free and not getting any return on it. As an attorney, my time and my knowledge are what I sell. Potential clients would call and I’d spend far too long on the phone giving too much information away. Part of it was the desire to help and perhaps some of it was the feeling that I had to give something to get something. When I realized I was essentially giving away hundreds of dollars at a time to complete strangers, who I never heard from again 95% of the time, I finally came to my senses. The shift in my attitude changed everything. Many people just want to try to get what they can out of you. When you are going to give back, as you should, it should be with a purpose, not because someone is conning you out of it. You have to really respect yourself and your time and energy, or potential clients will never do so. Consider offering the services you wish you had as a business owner in your field. I know an attorney who started her own virtual assistant company because she was constantly using VAs herself and got so good at screening and training them, that she figured she would make money doing so. I am currently flirting with the idea of starting an app to integrate with other legal software. No one knows what an industry needs more than those “in the biz,” so if you can come up with a service you would pay for yourself, and make it a reality, you can make a killing. A group of female attorneys got together at a luxurious spa on the beach and spent the day there. It was the best networking event I have ever been to and I am already getting work referred to me from the fabulous women I spent quality time with that day. I am currently using Practice Panther as my practice management software. It is a crucial part of the Firm. It allows me to assign tasks to staff (or myself), calendar events, track every case’s status, bill clients, run KPI reports, draft intake forms, create workflows…I could go on. It even allows me to assign events and tasks to clients, which is a feature they love. They really love when they get a text message reminding them that they have a call with me in 2 hours, I always get compliments on that small touch. You Are a Badass. Even the most confident business owner will get a kick in the pants from this book. It really challenges the self-limiting thoughts we all have and that we mostly don’t even consider. Being an entrepreneur is challenging and you often question yourself and whether you are on the right path. This book will give you that boost you need when self-doubt inevitably comes calling. Get help as soon as you can. Be creative about it. Part time, virtual, etc. – there is a solution you can afford. One person can only do so much, if you don’t find help at a certain point, your business will stop growing. Automation is worth multiple staff members. The more you automate, the more ways you will think of how you can automate more. It is a great habit to get into. Care about your clients. This is an easy way to set yourself apart. Remember that it is about them, not you. Grow your business around the client experience and you will be top of mind when someone needs a referral. Think small, stay small. Listen to your gut and then take a leap of faith.